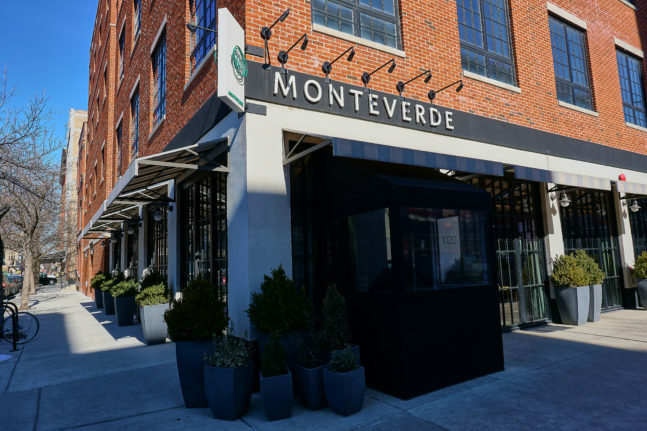 Chef Sarah Grueneberg’s passion for pasta at Monteverde Restaurant and Pastificio has earned her the James Beard Foundation Award for Best Chef Great Lakes and the Jean Banchet Award for Chicago Restaurant of the Year… just within the past year. FamilyFarmed is proud that Sarah will also accept our 2018 Good Food Chef of the Year Award at our Good Food Festival on Saturday, March 24 — and will conduct a cooking demo at our Chefs at Play stage. 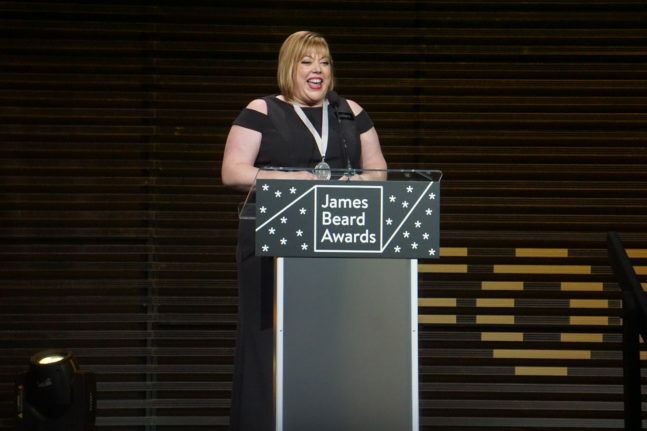 Texas native Sarah’s road to stardom started in 2001, right out of culinary school, at famed Brennan’s of Houston; she benefited from the mentorship of Chef Chris Shepherd (who went on to precede her as a James Beard Award winner). In 2005, she moved to Chicago to work at Spiaggia, an iconic Italian restaurant, quickly rising to chef de cuisine (and eventually to executive chef). In 2012, she was a finalist in the Top Chef competition on the Bravo TV network. All of this happened by the time Sarah hit the age of 30. Sarah left Spiaggia in late 2013 to develop Monteverde Restaurant & Pastificio (which means “pasta factory”) with business partner Meg Sahs. The restaurant, with an open kitchen where Sarah performs her pasta-making magic, opened in early 2015 to rave reviews and crowds that have only gotten bigger since she claimed her James Beard medal last May. 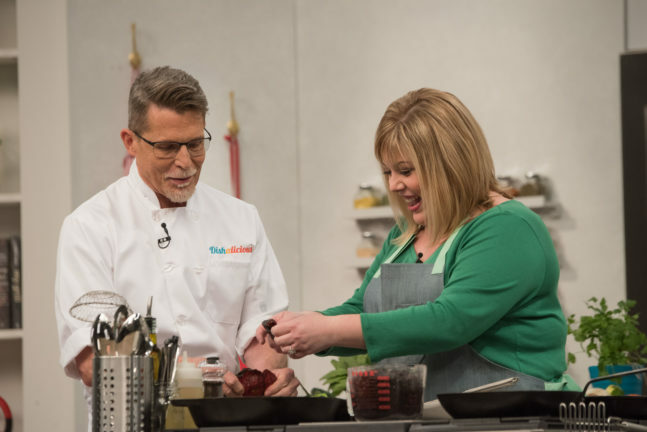 Next up: the airing, starting in April, of three pilot segments of “Dishalicious,” a TV show featuring Sarah and other renowned chefs cooking from various ethnic cuisines. Please enjoy the following excerpted interview that FamilyFarmed conducted with Sarah, in which she discusses what drew her to her culinary career, her philosophy about dining and hospitality… and her teenage passion for The Doors. Bob Benenson: Tell us about your early background and your interests in cooking. Sarah Grueneberg: I was raised as the single child of a single mother. Cooking became part of my entertainment. Food Network came on when I was about 12 years old. That was the first time I thought, “Wow, there are actually chefs.”… Right when I became old enough, I went right into culinary school, when I was 17. I never looked back. Bob: I found an article in which you talk about five books that changed your life. Four of them were cookbooks, and one of them was about The Doors, and you ascribed that to your rebellious teenage years. The Doors were part of my rebellious teenage years, but Jim Morrison was still alive then. Sarah: I was a rebellious teenager. I didn’t want to go to school, I wanted to be cooking. The music and cooking and being with friends was where I felt comfortable, making people happy… All my friends would come over to my house and there would be a big pan of lasagna at 5 or 6 o’clock. I think a lot of times we don’t realize that we love to feed. The first time it happens is because we love to eat. If you don’t love to eat good food, then it’s hard to be a chef. Once you put the connection about feeding people, that is really the encompassing part of being a chef. Bob: To get a first gig in a restaurant like Brennan’s, you must have established your reputation coming right out of culinary school. Sarah: I basically pried my way into the back door. Chris Shepherd came into culinary school, he went to the same school as I did, and he says, “Who wants to bake? Who wants a job? Who’s ready?” And my hand shot up, and I said, “ME!” I was 19 at the time, and he was like, “Call this number at 3 p.m. and we’ll set it up.” I called. “He’s not here.” I called again. No answer. Next day, called again, Chris wasn’t there. So I was like, Oh, man, I better show up. So I just showed up at the back door. “I’m here, I want to work.” One of the other sous chefs at the time looked at him and said, ‘Well, she’ll be your problem.”… At that moment, I knew Chris was going to be my mentor. Bob: You moved to Chicago. What drew you to Chicago and what drew you immediately to Spiaggia? Bob: How did you develop such a strong interest in Italian cooking? Bob: The availability and the market for Good Food has changed so dramatically just within the past few years… How has it changed from your perspective as a chef in terms of the availability of the ingredients? Sarah: One of the best things that’s happened to Illinois and Chicago is MightyVine tomatoes, and having tomatoes around year-round. It’s amazing. It really helps my Italian cooking… When I was at Spiaggia, it was challenging because we really wanted to make ingredients from Italy, we would import a lot of ingredients. 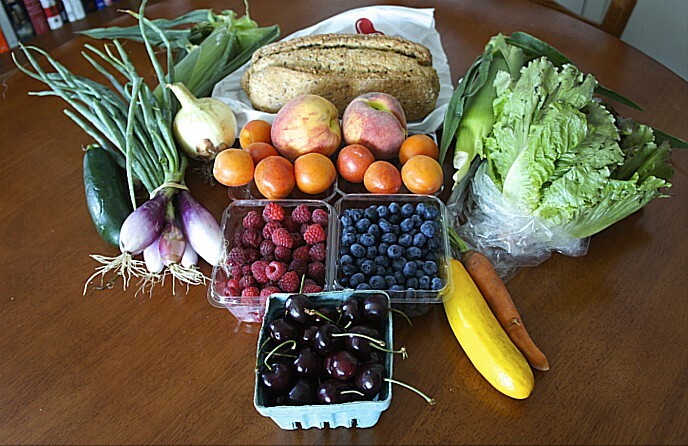 The shift happens that you start to bring and use more ingredients from the Midwest. Bob: Flour is very fundamental. We’re working on a project at FamilyFarmed to promote organic grain from Illinois. Is that something that you as a chef would be really interested in, or is the quantity you’d need for a restaurant like this still off on the horizon? Sarah: To find grains grown here organically would be incredible. Right now we do use stuff from Spence Farm [in Fairbury, IL], from Marty [Travis], who I love, he’s one of my favorite people in the world. We use his polenta. Durum wheat, though, and semolina is usually grown more north of here, and that’s used in pasta. The issue we have for using local grains here for pasta is 00 grind. A lot of mills are just a 0 mill or an all-purpose mill. But to make a truly great pasta dough, I think you need the finer mill of 00. If we could get a mill that was grinding down to that, it would be incredible. It would be a life-changer. Bob: What does a “pastificio” mean? Bob: Monteverde. Green mountain. Where does that come from? Sarah: Monteverde is my last name in Italian. Grueneberg is green mountain in German. When I first went to Italy they said, “Now you are Sarah Monteverde.” I thought, Sarah Monteverde, that’s the best name ever…. Bob: I was at the James Beard Awards last year when you won. Q: What impact does that have from a business standpoint. You had packed houses to begin with. Did it increase? Sarah: Oh, yes, it did. I was shocked. Some people were like, “Congratulations on your James Beard Award.” And I was, “What? How do you know about that?” People are very excited. Bob: And then of course the most important award of all, the FamilyFarmed Good Food Chef of the Year. Bob: What do you want to tell our community about yourself, about Monteverde, about your commitment to providing all of this wonderful food? Sarah: That’s a hard question. 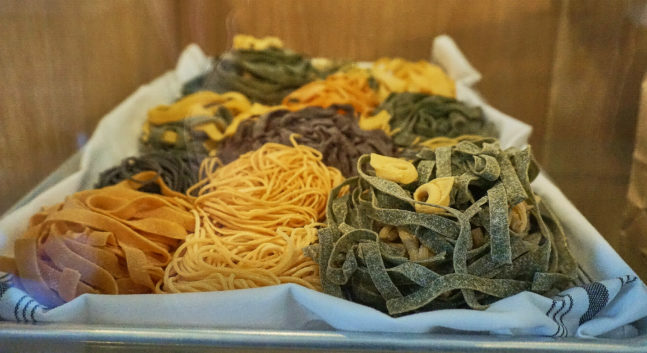 I think that being here and being able to source so many different ingredients, like we discussed, and creating a restaurant that truly is a passion project that is all about the pasta creates an opportunity for us to really feed people soulfully. I really want someone to come in and feel like they’ve been taken somewhere. A memory, a place. A lot of chefs say this, but for me, it’s truly important. I cook from an emotional place, not from a place of knowledge. I want people to feel something when they come here or when they have my food. Bob: Finally, tell us about your TV show. Sarah: Dishalicious. So fun. David Manilow, who’s the co-creator of Check, Please!, he saw me on CBS Saturday Morning doing an interview, and he thought, “That’s my host!” He called me and said, “What do you think, do you want to do a new show?” and I said, “Are you insane? Yes, of course I do.”… Dishalicious is really a fun show. It’s like a dinner party and a learning demonstration-style cooking show all into one. There’s three guest chefs an episode and they all cook different dishes to put great meals together. Sarah Grueneberg’s Chef of the Year Award highlights the all-star lineup for the Chefs at Play Stage at FamilyFarmed’s Good Food Festival on Saturday, March 24. Other participants include Chicago culinary giants such as Rick Bayless of the Frontera restaurant group; Andrew Zimmerman of Sepia and Proxi restaurants; Jason Vincent and Ben Lustbader of Giant and City Mouse restaurants; Judson Todd Allen, author of The Spice Diet; Ina Pinkney, the “Breakfast Queen of Chicago;” and Tom Van Lente with Purple Asparagus, which brings engaging food lessons into Chicago’s public schools and will reprise its longstanding role as producer of the Festival’s family-friendly programming. 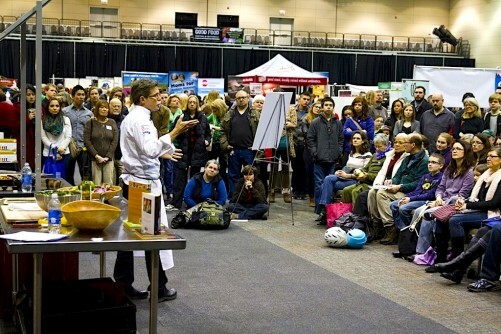 General admission for the Festival — FamilyFarmed’s public celebration of the fast-growing Good Food movement — is free, with pre-registration on the Good Food EXPO website required. Tickets can be purchased for the Festival’s Master Class on culinary uses of vinegar, featuring author Michael Harlan Turkell with Abe Conlon and Adrienne Lo, co-owners of Chicago’s Fat Rice restaurants. An overview of the Festival can be found here. Tickets also are on sale for The Good Food Trade Show: Production, Policy, & Industry Exchange — the first day of the EXPO, on Friday, March 23. An overview of that day’s great programming can be found here. This entry was posted in Chef advocacy, Farm to table dining, Food Artisans, Food Entrepreneurs, Good Food Dining, Good Food Festivals, Good Food restaurant trends, James Beard Foundation Awards, Jean Banchet Awards, Restaurants and Good Food, Sustainable dining, Uncategorized and tagged Andrew Zimmerman, Bravo network, Brennan's of Houston, CBS Saturday Morning, Check Please, Chef Chris Shepherd, City Mouse Chicago, Dishalicious, FamilyFarmed, Fat Rice restaurant, Food Network, Frontera restaurant group, Giant Chicago, Good Food Festival, Good Food Trade Show, Ina Pinkney, James Beard Foundation Awards, Jean Banchet Awards, Judson Todd Allen, Michael Harlan Turkell, MightyVine tomatoes, Monteverde Chicago, Proxi Chicago, Purple Asparagus, Rick Bayless, Sarah Grueneberg, Sepia Chicago, Spence Farm, Spiaggia, The Doors band, The Spice Diet, Top Chef TV show. Bookmark the permalink.